BTXpress Electroporation Solution is a single buffer solution developed to quickly and efficiently deliver genes into mammalian cells that were previously considered “hard to transfect” by chemical and other non-viral methods. 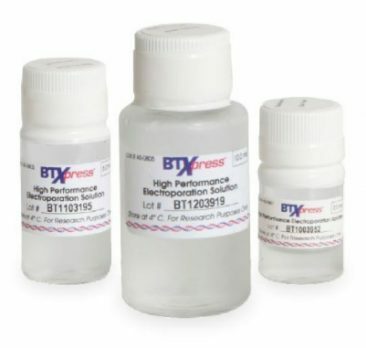 BTXpress Electroporation Solution is the first electroporation reagent that meets all your high performance transfection needs without sacrificing control over your experiment or your budget. It offers increased numbers of transfections per kit compared to other commercial alternatives, providing higher value to you. The BTXpress Electroporation Solution is offered as a kit including the BTX Cuvettes Plus with transfer pipettes or as a buffer alone. Single buffer for all cell types.